Green Apple - International Trading, Lda is a Portuguese based company with international activity, that is dedicated to furniture design, manufacturing and distribution, ornaments, linen and lighting, for private housing and hotel-ware, by the name of Green Apple Home Style. With Green Apple Home Style brand, the company able to develop exquisite collections, creating elegant and sophisticated pieces that are manufactured according to the highest quality and functionality standards. They ceaselessly seek for innovation, when concerning materials and design, enables them to nurture unique style collections, who emanate contemporaneity, comfort and exclusivity. Fostering national design through innovative processes, in the furnishing and interior decor industry, has turned Green Apple into one of the very few Portuguese luxury brands to achieve 100% local manufactured pieces, exporting on a worldwide level. Green Apple - International Trading, Lda invests in the best raw materials and their best ally is their tradition. “Made in Portugal” is their identity, leading them to a thriving future. They successfully combine tradition with modernity, their creative young team design bold and unique pieces that blossom with their experienced handcraft masters. Their focus lies in the perpetuation of their handcraft masters art, ensuring knowledge transfer amongst generations, which culminates in the needed heritage preservation. What a curvaceous Chaise Longue for any room in your home, upholstered in blue velvet and gold. It would look gorgeous in your living room, bedroom, family room, home office/study/library or conservatory/music room. Such a stunning design that will also have your guests linger in front of it and admire it. Wooden chaise longue upholstered in blue velvet. Base in semi-gloss oxidized gold finishing. 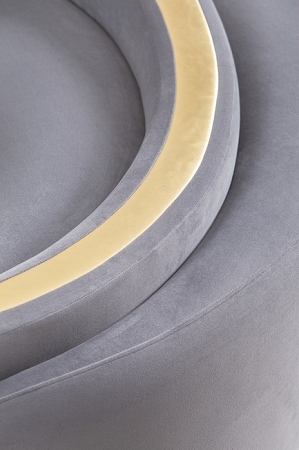 Central detail upholstered in golden leather. Please measure the wall or area where this piece of furniture or wall art will be placed in your home before ordering. Please also measure your front door, side door, back door entrances into your home and any inside archways or doorways that the piece of furniture or wall art must go through, in order to get to the room you will be placing it in, also to make sure it goes through without any damages to your doorways/arches/walls and damages to this piece of furniture or wall art. No Returns, No Refunds, No Store Credit, No Cancellations since this piece of furniture is being handcrafted and created for you from the time you ordered it. Although this item says: "Free Shipping", for reasons that the back office program of the website does not have any other alternative choices, the retail price of this piece of furniture already includes shipping costs and transportation insurance costs from Portugal directly to your address and "white glove" delivery into your home with assembly when required. Please also note that customs duties into the USA are also already included in the retail price of this piece of furniture. Please do not choose a shipping carrier in the shopping cart and do not enter anything in the "Calculate Shipping" section either, just go directly to "Proceed to Checkout". Since this is a "white glove" delivery, one of the homeowners must be home to accept and place the furniture on the day of "white glove" delivery. The fabricator's USA warehouse will notify you, at their best efforts, to provide you with the "white glove" delivery date and time frame.